and taste of the pongal. Hence, I decided to document this recipe. Roast the rava finely in a pan without getting it burnt. 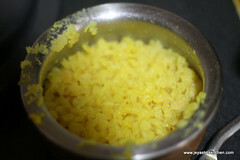 Pressure cook the moong dal till it becomes mushy. 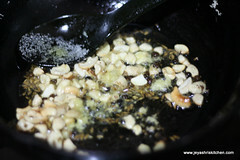 In a pan, add ghee and oil, add black whole pepper, ginger and cashew nuts. Fry in a medium flame till the cashew nuts turn golden brown. Add the cumin seeds now and immediately add water. Do not allow the cumin to roast for a long time as it will spoil the taste. Add 3 cups of water and bring it to a nice boil. Add salt. Once the water starts boiling, add the roasted rava to this. Keep it in a low medium flame. Once it starts cooking add the cooked moong dal. 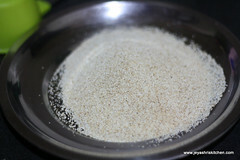 Mix well and let it sit for a while till the pongal consistency reaches. 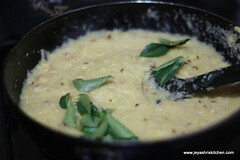 Garnish with curry leaves and if you want add a tsp of ghee to this you can add now. Serve hot with coconut and Tiffin sambar. *The water measurement is for cooking the rava not included for cooking moong dal. You can roast the moong dal for 2 minutes and then pressure cook if you wish. Never roast the cumin seeds for a long time as it will give a medicinal smell. 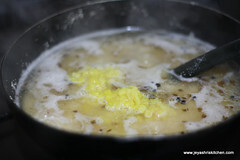 I added whole black pepper, you can even coarsely crush and add to the Rava Pongal. I have kept my coffee tumbler empty. It is just used as a prop for the photo. I made another version of it. The dal was roasted and powdered. Once the rava was roasted, both were pressure cooked. It was quite nice. I thought it needed a few more changes. This is another method of cooking it and I will give it a try. Delicious pongal. Looks great. I make it very often. Beautiful clicks and comforting recipe! Looks yummy .. I make it too, but the one with rice is made more often at my house. 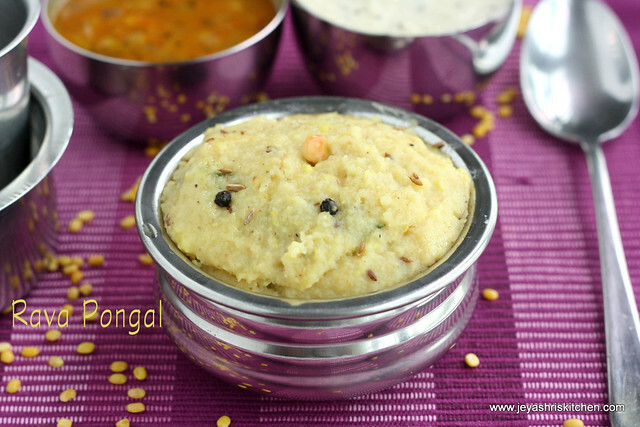 I am not a big fan of the regular rice pongal,but I think I'll like this rava version.Looks delicious! 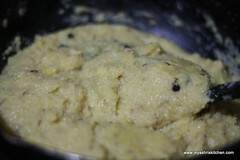 Tasty pongal, even I make this sometimes..
Looks good. Nice alternate for the rice pongal. i love this and made it a few times, but never actually blogged..looks so delicious..
your pics are so great now jey, one better than the other. this is a favourite of mine and my MIL makes it very well. ps: i laughed at your coffee tumbler line :D i remember our discussion about it. Thanks nags for your sweet and encouraging words. Even when i was writing coffee tumbler line i remembered our discussion. Precautionary measure dhan!! looks yummy.. 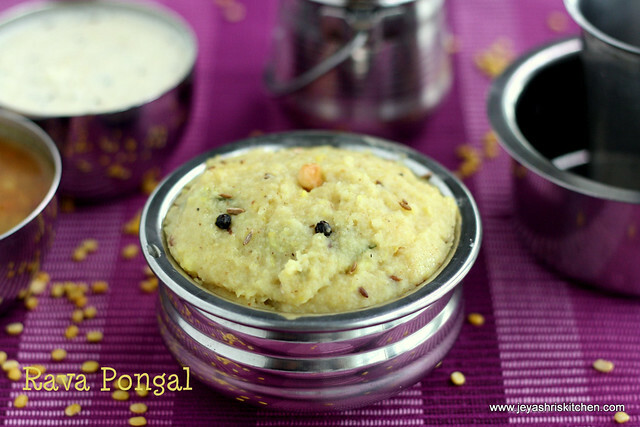 This is one pongal I can eat! rava pongal is handy jey ! and pictures are great ! Its been a while i had this pongal,love to have it for tonite dinner. 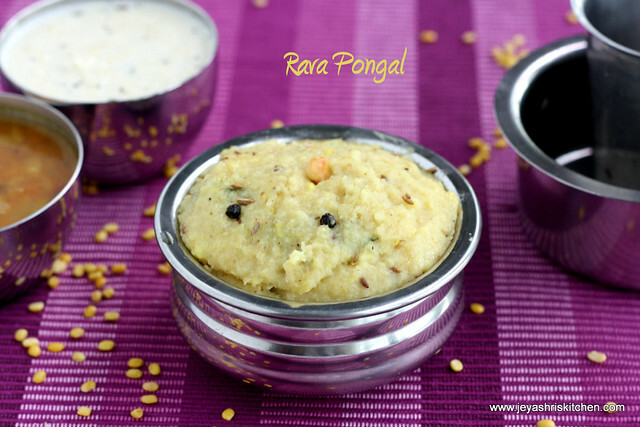 My mom never made rava pongal.. i first tasted it when my husband's aunt made it and liked it. I often make the spinach - broken wheat pongal from sailus kitchen... must make this regular version sometime. Lovely pics. Looks so delicious...Nevre tried pongal with rava..
Kindly let me know what about Salt for test and chopped green chilly or red chilly powder. 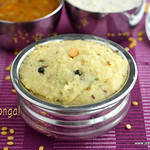 My fav Pongal,loved it at any time...yum! 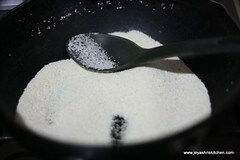 Hi I loved your rava pongal and would like to see and try some more ite,s. Is rava 1/2 cup or 1.5 cup? Searched the recipe from your website and tried this recipe It came out very well.Thank you very much for this recipe. Excellent. Very simple way of guidance. The photos are adding further guidance. Continue your good work for our sake. Yes I also tried and excellent.